I have a Master”s Degree in Social Work from Indiana University and a Certification as a Health Coach from The Institute of Integrative Nutrition in New York City and am a Certified Lifestyle Professional. At Renovare Wellness By Design, I assist patients in the design of healthy meal plans that include new, nutritions and easy to prepare foods. Since food alone may not resolve all heath issues, we may also work on achieveing deep restful sleep, enyoyable exercise plans, smart supplementing and de-stressing. Our goal is to design a lifestyle that supports the patient’s personalized goals for vibrant health. My professional experience includes social work, administration and fund raising in non-profits serving children with disabilities and in board positions supporting social services and peace keeping organizations. 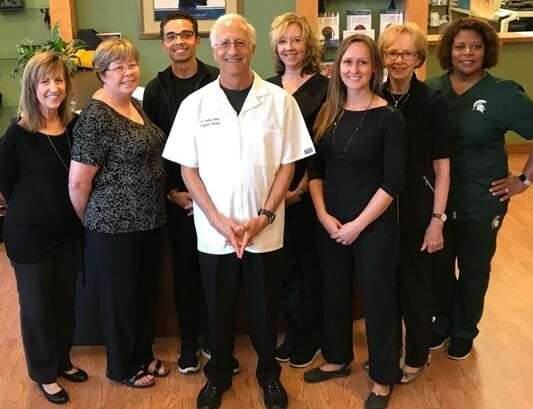 I joined Renovare in 2009 and embrace the organization’s philosophy for giving patients a pleasant setting in which to achieve their health goals through time tested and research based techniques. I love havnig the oportunity to see people enjoy new energy, hope and healing. Mycheal Gamble is a graduate of Western Michigan University holding a bachelor’s degree in Sociology and Psychology and Criminal Justice. Mycheal retired from the State of Michigan Department of Corrections after 25 years. She served as a Counselor in the Psychiatric Prison hospital. Mycheal moved to Arizona 12 years ago and has worked as a Career Coach before becoming a Certified Chiropratic Assistant with Renovare by Design. Mycheal also works as a Brain Mapping & Neurobiofeedback Technician with Renovare Brain Wellness. She is the mother of 4 children and Married to Herbert Gamble Jr.
Hi there! I believe it’s important to constantly work on improving oneself, in the safest, most effective ways possible. So, I find a lot of joy in the blessing of waking up each day, accepting where I’m at, and making the conscious decision to leverage my strengths to live better. Renovare is a great fit for me, and will be for you, because of the immersive experience we offer. It really does take an entire shift in mind and lifestyle to enjoy lasting benefits. I look forward to seeing you and building a new chapter in your journey to wellness! My name is Alice. I’ve been with Renovare for 3 1/2 years. I’m a Certified Chiropractic Assistant and Acupuncture Assistant. The best part of my job is giving hope to our patients. Lisa Roye began her journey in alternative health over 18 years ago when her ex-husband was diagnosed with a condition the medical field called “leaky gut” and ongoing bronchitis – but given no answers on how to heal these conditions. After much research and need for answers, this led her to herbal supplements and then opening her own business as an herbal and nutritional consultant in this field. She began expanding her business by increasing her own knowledge in this world of alternative health and improvement. This led to the integration of a microcurrent system utilizing bio-electric acupuncture techniques. She began taking classes from Clayton College of Natural Health and attending multiple workshops and seminars through allopathic and alternative health practitioners. She took classes in an alternative therapeutic approach known as “Total Biology” as well. Following a physical ailment of her own in 2005, Lisa was introduced to a bio-resonant assessment device for stress reduction through a naturopathic physician that helped “heal” her in what seemed to be a miraculous way. This dramatically expanded her curiosity in “energy medicine” and a whole new venture began. She brought this equipment into her business and became a certified biofeedback technician and continues to further her education in this area. She finds nothing more honoring and inspirational than others trusting her enough to allow her to come along side them in their own personal journey and self development. Knowledge is power, but the application of knowledge is transforming. I am so pleased to be a part of the team! I grew up in Boulder, Colorado – a very health conscious place. I am happy to be continuing this exciting wellness journey here at Renovare! I have always been interested in natural solutions for health, and I am amazed at the body’s design and ability to heal itself. We just need the right tools! I look forward to getting to know you in your journey with Dr. Gerhart! Hello Everyone! What brought me to Renovare after suffering a major head trauma and postural issues in my childhood; I was on a downhill slide in my adulthood. I connected with Dr. Gerhart when he started practicing. After consistent chiropractic care, we were able to slow the postural progression concerns. With Neurobiofeedback, the stress and sleep concerns that came to the surface have been greatly reduced. I can’t imagine where I would be health wise if I had not met Dr. Gerhart. I am so grateful for him and the staff at Renovare. I appreciate that Dr. Gerhart is a life-long learner and he implements advanced trends in functional health care and brain health for us to benefit from. It excites me when people come to the clinic and share “I have been trying to find someone like you for years!” It is a privilege to work at Renovare. When not working at the clinic, I shower affection on our second child, Bentley (See Picture). I love to read in my down time. Traveling domestically and internationally excites me. I push myself to exercise and love to try healthy recipes.